I am obsessed with soup at the moment. It is cold and wet and winter is upon us. I am very lucky to have received the largest Le Creusset casserole as a gift. It is a previously loved slate gray oval dish and at the moment it is sitting on top of my stove full of soup. I always start a pot of soup at the beginning of winter, and I add to it constantly, ensuring that I never run out. I play around with flavours and textures and last week, after making my zucchini bread I had a lot of courgettes left over. I decided to roast them and blitz them and turn them into a roasted courgette soup. Dave and I had a bowl each before supper and I drizzled ours with a little bit of truffle oil. 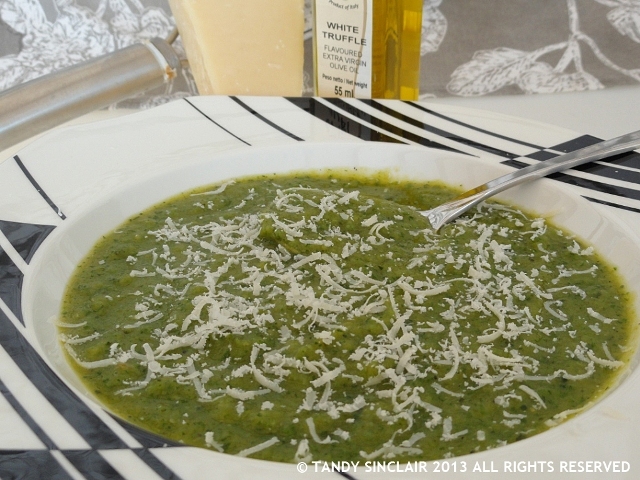 The next day I decided to try freshly grated Parmesan over the soup. Both were as good and equally delicious. I made my soup super thick as that is the way I prefer it, but if you prefer a thinner soup then add more stock. do you like thick chunky soup? I like the idea of roasting and the truffle oil…sounds delicious Tandy. I think we shall be doing this any day now. I have courgettes coming out my ears! Gorgeous – I can eat soup hot or coldany time of year! Love the idea of roasting the courgettes first, wonderful. Between the roasting and truffle oil, the soup must have had a delicious flavor. Have a whole bag of zucchini in the fridge and this is so easy for a busy tomorrow! Yes, the roasting will make all the difference: I recently bought one of the tabletop Eurolab ovens and have found it an excellent way to do small ‘bakes’ without heating up the oven. Thanks 🙂 ! Very good soup idea…I wonder if it would make a good cold soup as well. Mmm – love roasted vegetable soups – they have an extra dimension of flavour. Thick soups for me too! I am only just learning about roasting my soup ingredients first! And with a slice of sourdough bread, it is perfect!